The candidates running for state House and Senate and for county sheriff will share their ideas for governance at a forum hosted by Presque Isle High School students on Wednesday, Oct. 17. PRESQUE ISLE, Maine — The candidates running for state House and Senate and for county sheriff will share their ideas for governance at a forum hosted by Presque Isle High School students on Wednesday, Oct. 17. The candidate forum is part of Presque Isle High School’s civics class Project Citizen curriculum, said Zachary Powers, chair of the social studies department at the high school. The forum will be held starting at 5:30 p.m. at the Presque Isle Middle School Auditorium. The first such forum organized through PIHS was held in 2016 and “was warmly received by the candidates and community as it was the only venue that political candidates had been given the opportunity to speak publicly on major issues,” Powers said. The high school’s social studies staff decided to make the forum a part of the Project Citizen curriculum during every legislative election cycle, Powers said. 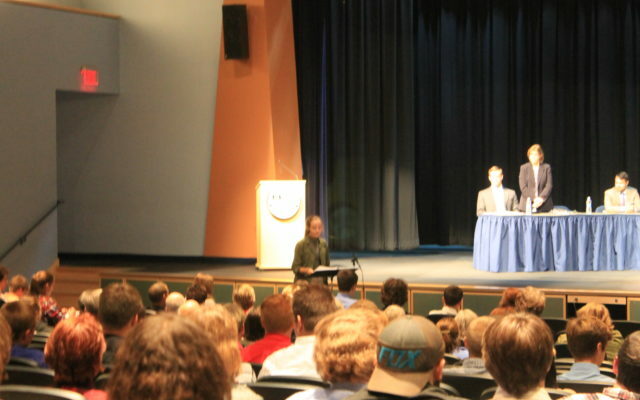 Powers said that students will be researching the candidates and issues in class, and then at the forum asking each candidate two-to-three questions, with three minutes to answer. At the end, each candidate also will have four minutes to make closing statements.